Could This Be A Done Transfer Deal for Arsenal? HomeTransfer NewsCould This Be A Done Transfer Deal for Arsenal? Bayern Munich have sealed a pre-contract agreement to sign Lucas Hernandez of Atletico Madrid for £68 million. The Bundesliga outfit confirmed on Wednesday that the left-back will head to the Allianz Arena on a five-year contract on July 1. The Frenchman who was part of the 2018 World Cup winning team in Russia has already undergone his medical during the international break. Scans revealed that the record signing has a damage to his right knee ligament, so he will no longer play any role for Diego Simeone's side as he requires surgery. Since this blog focuses only on matters related to Arsenal football club, why then are we concerned about a move involving a German and Spanish side? Rumours in the media in recent weeks claimed that Arsenal are eyeing a move for a left back who would be first choice over the aging Nacho Monreal. In the midst of that, David Alaba spoke about his love for Arsenal right from a very young age while also expressing his desire for bigger challenges. 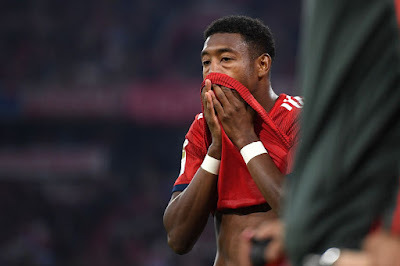 Many Gunners faithfuls saw that as an indication that there could already be talks between their club and the highly-talented left-back and Bayern's recent move will mean that Alaba will likely be out since another left-back is in. We do not expect him to be an understudy. Lucas Hernandez to Bayern. Does that mean the rumors of @David_Alaba to @Arsenal are true? Following the announcement of Hernandez's signing, the speculations have gathered additional momentum with some outlets suggesting that the 26-year-old is Arsenal bound. The manner in which several fans reacted to the news shows that they were of high hopes that the transfer will come to pass. Unai Emery urgently needs to strengthen his side for the coming season and in as much as he is after a left-back, we cannot say for now if Alaba is the one. June is not so far anymore. The truth will reveal itself by then.